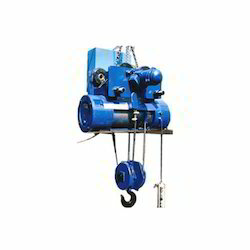 Leading Manufacturer of wire rope hoist for load lifting at docks from Ahmedabad. Our company offers Wire Rope Hoist for Load Lifting at Docks. These hoists enable smooth loading and unloading of heavy goods at docks. The sub components of our rope hoists are quality assured and are assembled with great precision at our unit. Each sub-part or assembly is resistant to wear and tear and thus, our products serve for long.